Police said the driver had this assault rifle propped between the center console and the front passenger area. 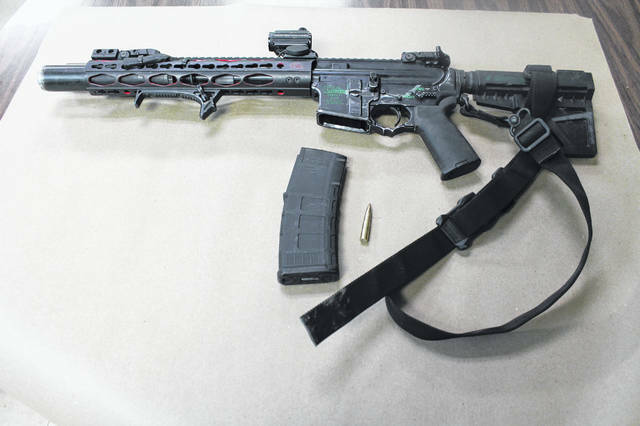 BLANCHESTER — A Fayetteville, Ohio man was charged after a traffic violation led police to discover the driver had an assault rifle propped next to him in the car, police said. Early Saturday morning, Blanchester Police Ptl. Ian Courtney stopped a car for an equipment violation in the 100 block of S. Broadway Street. The driver and sole occupant of the car was identified as Adam Verwold, 35, of Fayetteville, according to Police Chief Scott reinbolt. “During the traffic stop, Sgt. Gary Mowen arrived as a back-up officer and noticed an assault rifle propped between the center console and the front passenger sea,” said Reinbolt. “When Sgt. Mowen called out to Ptl. Courtney that there was a gun in the car, Verwold reached for the firearm. Officers ordered him to cease that movement and he immediately complied. His compliance with the officer’s orders avoided any use of force by them. “Further investigation revealed a loaded clip for the gun in close proximity to the firearm. The gun did not have a bullet in the chamber. “In hindsight, it appears Verwold’s movement to reach for the gun was instinctual when the firearm was mentioned and was not part of any effort to assault the officers,” said Reinbolt. He will answer the misdemeanor charges in Clinton County Municipal Court.